FIRST GRADE: New Norfolk I kept its finals hopes alive with a good 45-run win over Sorell at Sorell. After losing the toss and being sent into bat, the Red Caps faced out their 50 overs making the defendable total of 8/197. Veteran Stewart Rice led the charge with 37, hitting two fours and two sixes. Coach Todd Rusher made 34 with five well-struck boundaries, while opener Rohan Heron put on 29 (three fours) and Harry Booth 24 (two fours). In reply the home team was bowled out for 142 off 43.2 overs. It was a good overall effort by the New Norfolk bowlers, but it was Josh Walsh who bowled his 10 overs straight, capturing 3-21 in a great spell of bowling. Opener Joe McCulloch took 1-22 off 7 overs, Stewart Rice and John Ferguson got one each and young Nathan Rice who earlier made 8no with the bat, took 1-19 off 3, a great effort in first grade. There were also three run outs. At Clarendon Vale, Molesworth I went down to Rokeby by six wickets. Molesworth won the toss and had first knock but was soon in trouble at 4/25. Then 27 from Nick Piuselli (three fours, one six) and 17 from Sam Triffitt (two fours) steadied the ship a little. Batting at eight and nine, brothers Brad Ransley 43 runs (eight fours, one six) and Josh Ransley 30 (6 fours, one six) got the team's total to a respectable 10/175 off 37.2 overs. In reply Rokeby had little trouble reaching the target, finishing 4/178 off just 21.4 overs. 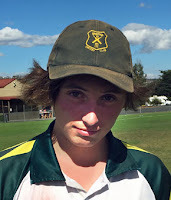 The best of the Molesworth bowlers was Jake King with 1-23 off four overs. SECOND GRADE: Due to the Sorell Cricket Club withdrawing its Second Grade team from the competition since Round 13, Gretna I had this round off. THIRD GRADE: Brighton defeated Gretna II at Pontville by 32 runs. Having first hit, the home side made 10/202 off 48.1 overs. A last wicket stand of 54 by the Brighton batsmen didn't help Gretna's chances. All the Gretna bowlers tried hard with Adam Browning with the best figures of 2-26 off 10. Brodie Gleeson 2/26 (6), Luke Crosswell 2/42 (10) and Aaron Browning 2/51 (7.1) were the other main wicket-takers. In reply Gretna was in deep trouble at 3/4 but a 47-run stand by Jordan Hastie with 20 runs (three fours) and Tom Allcock with 20 got things moving. It was the youngster Ryan Emery who top-scored, making a superb 56no. Fifteen-year-old Emery's innings was a pleasure to watch and included seven well-struck fours and one six. Emery shared a 60-run stand with Brodie Gleeson who made 20 runs. The pair gave signs of great things to come. In the end Gretna was bowled out for 170 off 45.3 overs. No results from the Bushy Park v Hobart were available, but reports were that Bushy Park won. FOURTH GRADE: New Norfolk II outplayed Bagdad at Tynwald Park by 90 runs. Winning the toss and batting, the Red Caps made 9/196 off their 50 overs. Wicket-keeper Leigh Berry led the way with a well-made 67, hitting seven nice fours. Shannon Long put on a show making 44, clubbing six fours and one six. Opener Mitch Rice made 20 while number 11 Liam O'Brien remained 14no. In reply Bagdad was bundled out for 106 off 31.4 overs. This was thanks to an excellent five-wicket haul by Jacob Wessing who finished with 5-35 off 7.1 overs. Four of Wessing's five victims were bowled. Opener and captain Jamie Hill swung the ball a mile and finished with the fine figures of 2-11 off seven overs. Aaron Drew also did well taking 1-16 (7). With this win New Norfolk II keeps in touch with the race for a finals spot. At Bothwell, the Bucks defeated Rokeby by 80 runs. The home team had first knock, making the good total off 10/193 off 40.1 overs. Nathan White made a good 37, while Joey Eyles 33 and Matthew Eyles 31 gave good support. Rokeby gave 40 extras. In reply Rokeby was knocked over for 113 off 22 overs with Peter Hansch doing the damage taking 4-29 off five overs and Brock Nichols 3-25 off six overs. Bothwell remains second on the ladder. Playing against Richmond/Cambridge at Richmond, Molesworth II recorded a good 51-run win. After being sent in to bat, the visitors made 10/176 off 39.4 overs. Molesworth was looking good at 9/104, but a match-winning 72 run stand by Martyn Evans (who made a valuable 46no) and Liam Triffitt (11) got the team to a defendable 10/176 off 39.4 overs. Earlier Brad Coppleman made 25 (two fours, one six). In reply the home team was bowled out for 125 off 35 overs. Brad Coppleman 3-26 off eight overs and Jeremy Nichols 3-32 (8) cleaned up the batsmen in great spells of bowling. Captain Martyn Evans and Liam Triffitt capped off a great day each, taking 1-5 (4) and 1/15 (4) respectively. SIXTH GRADE: At Boyer Oval on Sunday, Bothwell II 6/164 defeated New Norfolk III 9/138. The Bucks won the toss and had first bat. Thanks to half centuries from Stuart Eyles 57 runs and Kelvin Eyles 51 runs the team was able to make a defendable total. For the Red Cap bowlers, captain Brad Kemmler bowled well taking 4-24 from his 10 overs while Graeme Rowlands was tight with 1-15 off 10 overs. In his first match for the club, Blayne King got 1-32 (6). With the bat David Mitchelmore made a very good 42 runs (two fours) while Graeme Rowlands was the only other batsman to make double figures with 18 (one four). For the Bothwell bowlers Simon Eyles was the main wicket taker with good figures of 3-16 off six overs while next best was Stuart Eyles 2-20 (7). In this match New Norfolk gave 38 extras and Bothwell 52.